Hubbard Woods comes alive on First Friday nights! 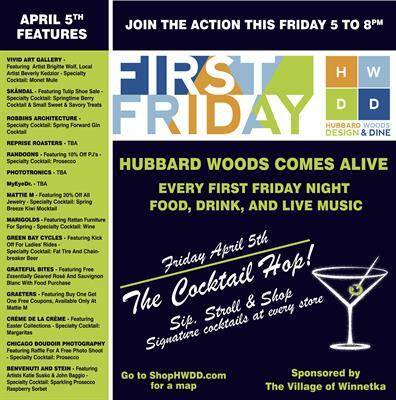 The Hubbard Woods Design District (HWDD) continues to host its exciting monthly “First Friday” events! On April 5th, the district will feature a Cocktail Hop, with each store featuring its own signature libation. Stroll the neighborhood and taste them all! Participating businesses will feature unique offerings including lively art, striking design, special presentations and must-have new products. First Friday hours will be from 5 to 8 pm. All locations will offer drinks and food, and some will even have live music! Participating stores are identified with festive “First Friday” signs and balloons out front. First Friday Design District maps are available at all locations. The Hubbard Woods Design District is an association of businesses located in the three-block retail area on the north end of Winnetka along Green Bay Road between Tower Road and Scott Avenue, commonly referred to as “Hubbard Woods.” Its designation as a “Design District” reflects the heavy concentration of art, fashion and design-focused establishments in the area.